Creating promotional material for an exhibition to be held further in the future. The graphic material uses experimental typography & fluid graphics. For this project, I merged conceptual skills, a sense of layout and typographical knowledge to create results in print and motion graphics. I aimed to design a conference of very extreme conceptual and experimental content about a topic that addressed a future technology, that may not exist yet, but is grounded in reality. I used experimental graphics in order to showcase my ability to break away from conventional rules of type structures and grids for more dynamic ones. 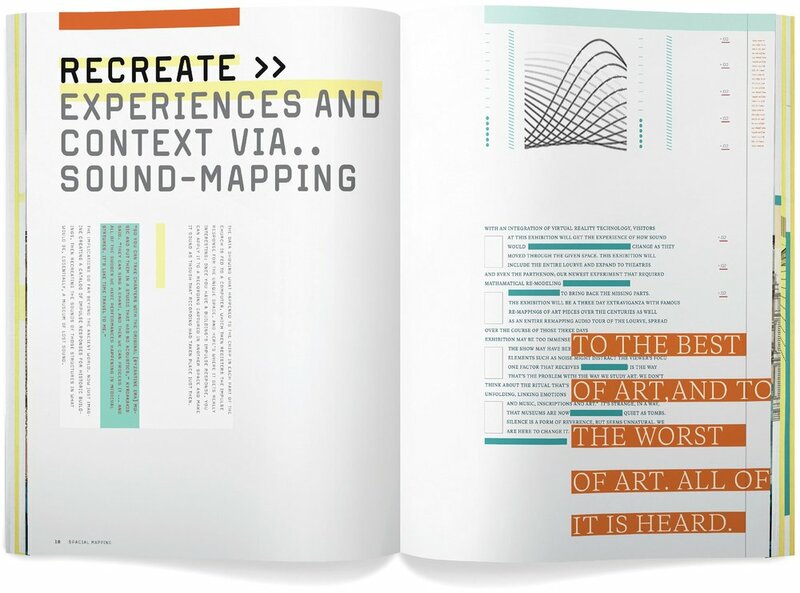 The scientific discoveries being showcased in this book aim to explain what audio mapping is, and the technology used to create audio replicas of famous art and architecture from the past few decades. It celebrates the audio contextualisation of art and history for all the future generations by analysing the acoustics of buildings and key sensory triggers in famous paintings. The type and graphics show how through impulse response, visitors are able to listen to the acoustics of architecture as well as iconic paintings, preserving them for all future generations to come. The experimental design and typographic treatment reflects these scientific discoveries in an experimental and out of the box manner.